QuaHill enables direct communication with SDL Trados Studio Professional and memoQ (Project manager edition is required). How are files analyzed and SDL Trados and memoQ projects created in QuaHill? 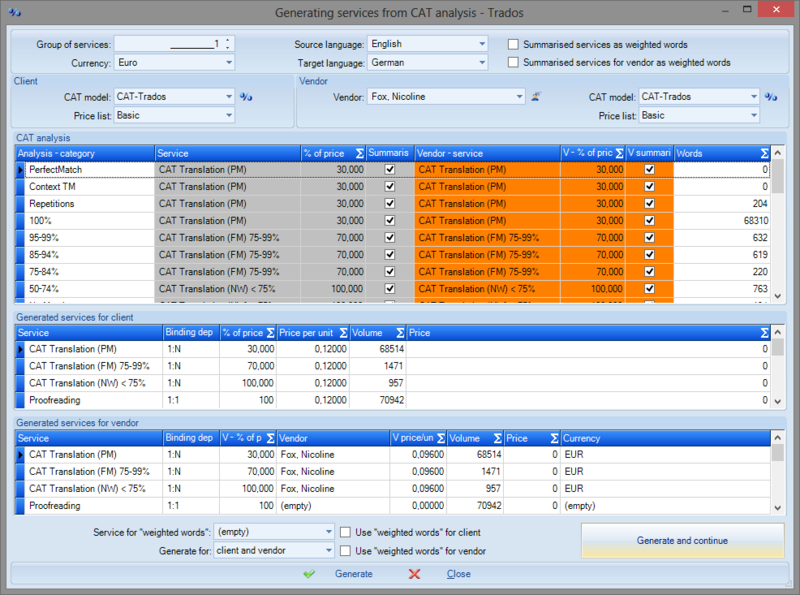 QuaHill can upload CAT tool analyses, such as Trados, MemoQ, Transit, Translation Workspace analyses, and generate jobs in projects or quotes accordingly. Percentage discounts for Fuzzy Match and Repetitions are defined in CAT models. You can have an unlimited number of them. For every client or vendor, a default CAT model can be defined. CAT models are used to define relations between individual CAT analysis segments (Fuzzy Match, Repetition, No Match, etc.) and service code list services. Discounts can be defined for individual segments; if the segments are used within a job or a quote generation, the final service price is automatically reduced by the discount. Nothing needs to be set manually. The system inserts everything from the CAT model. Does QuaHill enable direct communication with SDL Trados Studio? Yes, QuaHill can analyze files and create Trados Studio projects directly from the job or quotation (video). SDL only enables this function for the Professional edition of Trados Studio. The supported versions are SDL Trados Studio 2014/2015 and higher. To communicate with SDL Trados Studio, the QuaHill communication interface for SDL Trados Studio must be installed (info here). How is a CAT analysis generated? It is very easy. In the project details, using right mouse click above the job list select "Generate jobs from CAT analysis" . A window appears. Select the language combination for which the job is to be generated, the client's CAT model, the vendor's CAT model, upload an analysis, add a vendor, add unit prices for a client and a vendor (to make the process faster, keyboard shortcuts are available) and generate the job. 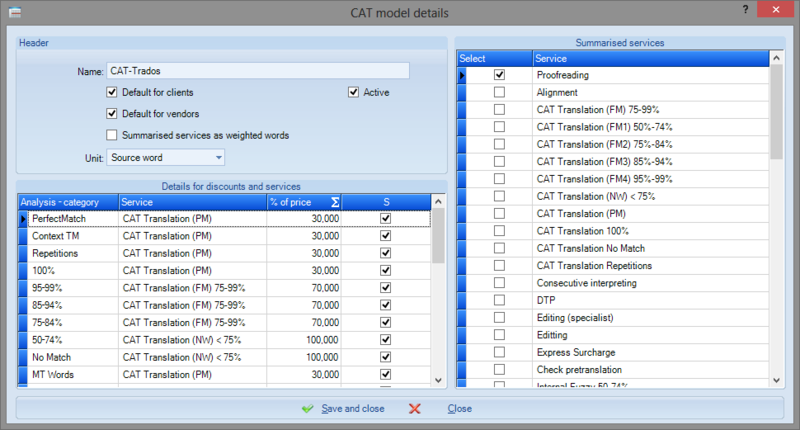 The job is generated fully calculated, including the price calculated on the basis of the CAT model used and the scopes uploaded from the CAT analysis. Should a job for another language combination be generated, you simply select a different language, a vendor, add a unit price and generate the job. It is not necessary to upload the analysis again so the process is very fast. Is it possible to generate jobs for a vendor only or is it possible for a client as well? Yes. While generating jobs, it is possible to decide whether jobs should be generated both for the client and the vendor or only for a client or only for a vendor. Is weighted-words generation of jobs supported by the system? Yes, jobs can be generated as weighted words. We use a CAT tool which QuaHill does not support. Is there any solution? Certainly. If you submit a sample of your CAT tool analysis, so long as it is technically viable, we will add the analysis upload for free. Do not hesitate to send us your request via email support@devdivision.net. For a translation company with a large turnover choosing a right CRM/ERP system for registering jobs, accounting, reporting and so on is a life-and-death issue. That is why we analyzed many industry specific tools and finally decided to use QuaHill: a reasonable price, easy-to-use, wide functionality, lots of settings many of which may be customized to the specific requirements of the admin and/or user, handy statistics, all data (incl. files) of our clients, vendors, payments, etc. can be stored in one single program(!). Using this tool within a year we also enjoyed excellent communication and very responsive support, flexible approach of developers who fulfilled our wishes adding special functions and adjusting things for comfortable work of our staff. After one year passed we are still happy and will continue using QuaHill.